WEG's WG20 geared motors were developed using finite element analysis. 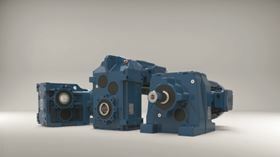 WEG has expanded its WG20 family of geared motors with helical, parallel-shaft and helical bevel gear units featuring rated torques from 820 to 1,550 Nm. Available in two frame sizes, they have rated torques from 50 to 600 Nm and have monobloc cast iron housings and rated torques up to 1,550 Nm. The motors aim to provide power transfer over the entire speed range and are available in energy efficiency classes up to IE3. All technical data is retrieved by a QR code on its nameplate. The serial number gives users online access to all product information and operating instructions. The WG20 geared motors were developed using finite element analysis. The small motor pinion allows for lower circumferential speeds in the first stage and aims to reduce noise emissions. It allows the gear units to be implemented in two or three stage designs over a range of gear ratios. This can result in low losses, while the tooth geometry additionally can enable high output shaft speeds and allows speed ranges to be covered with a single frame size. The housings can be produced to close tolerances because all machining is performed in a single clamping operation. Their smooth surface makes the geared motors suitable for food processing.